Santa Claus and “Don’t Tread on Me” Out of Business? The Democrat Party is calling for reparations. Some Christian Ministers are saying that if you don’t support reparations you are of the devil. Thabiti Anyabwile, pastor of Anacostia River in Washington, D.C. and a council member for The Gospel Coalition, is one of them. Here’s some of what he is saying. If my neighbor commits a crime, it’s my neighbor who should pay restitution. The Apostle Paul is adamant that he who steals should stop stealing and then work so “he will have something to share with one who has need” (Eph. 4:28). Implied in this is to pay back the victims of his theft because it’s the biblical model (Ex. 22:1, 3-6, 14). Zaccheus followed a similar biblical law. Zaccheus was a tax collector. Collecting taxes is not in itself immoral since the Bible says we should pay taxes if those taxes are due (Rom. 13:7). It seems that Zaccheus was exploiting his position as a tax collector by skimming some of what he collected and keeping the “profit” for himself. After his time with Jesus, Zaccheus said, “Behold, Lord, half of my possessions I will give to the poor, and if I have defrauded anyone of anything, I will give back four times as much” (Luke 19:8; cp. Ex. 22:1). If he had defrauded anyone he would make restitution. The crime and guilt were his alone. David’s crime was his alone. The nation did not have to make restitution for the death of Uriah the Hittite (2 Sam. 12:6). Only David did: “You are the man” (2 Sam. 12:7), Nathan said. Who is guilty of “man-stealing” in the United States? Those who engaged in the slave trade and profited from it. These people are long dead. Their children are dead, and their children are dead. In addition, there are those living in the United States who came to this country at a time when slavery was illegal. What kind of logic would demand that they pay for reparations when they had no part in the slave trade at any level? My grandparents didn’t steal their labor. My parents didn’t steal their labor. My children didn’t steal their labor. My grandchildren didn’t steal their labor. I suppose the argument would be that even though these people and their descendants did not participate in the slave trade directly, they’ve benefited from the effects of the slave trade in an indirect way. But that would be equally true of descendants of slaves. For all that is in the world, the lust of the flesh and the lust of the eyes and the boastful pride of life, is not from the Father, but is from the world (1 John 2:16). What’s the antidote? It’s certainly not a manufactured guilt trip. If you want to know if you’re guilty of anything, where should you turn? God’s commandments. I quoted some of them above. By this we know that we love the children of God, when we love God and observe His commandments. For this is the love of God, that we keep His commandments; and His commandments are not burdensome. For whatever is born of God overcomes the world; and this is the victory that has overcome the world—our faith (1 John 5:2-4). 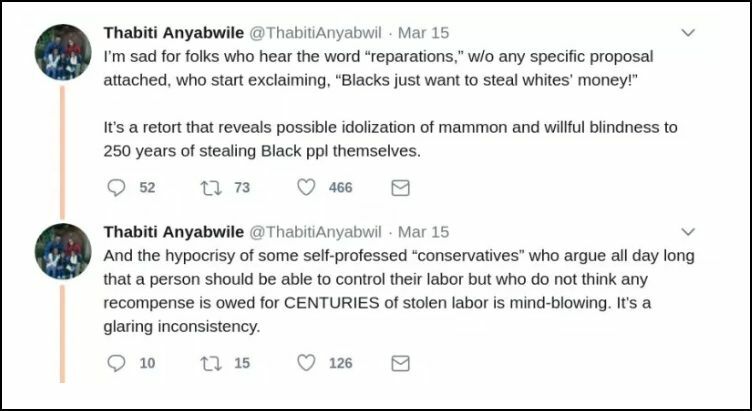 As far as I can tell, Thabiti Anyabwile hasn’t listed any commandment that supports his claims. He is involved in a game of guilt manipulation. Making amends for present sins and crimes is the church’s business, and there’s enough of those to go around. Then there are present crimes committed by our civil government — everything from wealth confiscation and redistribution to redefining marriage and enacting laws that permit women to kill their unborn babies. 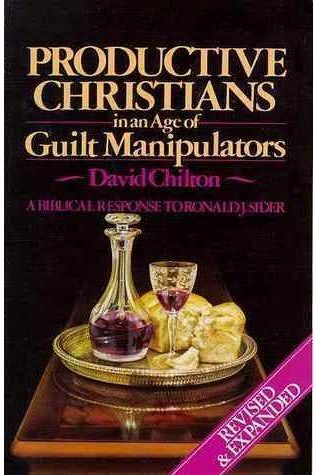 The best book on this subject, as well as one of the best introductions to economics from a biblical perspective, is David Chilton’s book Productive Christians in an Age of Guilt Manipulators. You can get the FREE PDF version of his book here. Next What’s This Mantra Against 'Thoughts and Prayers'?